Time for a giveaway!!! And this time you will be getting a chance to win a PROFESSIONAL NAIL CARE KIT from –Minus417, just perfect for a home manicure & pedicure but gives salon-worthy results. Now for the description of the products and the rules of the contest. A relaxing and refreshing cream enriched with moisturizer, for softening dry and cracked soles. Leaves your feet feeling fresh and prevents unpleasant odors. What is the uniqueness of the Vitamin Mineral Complex? • Maintains the natural humidity of the skin by improving the mineral balance of the cells. • Strengthens the natural protection of the skin. • Delays skin aging by regenerating new skin cells. • Improves body, face, skin texture, hair and scalp. • Eases rheumatic pain in muscles and bones. • Detoxifies, cleans skin thoroughly. • Anti Allergen and suitable for sensitive skin care. • Increases cell metabolism and activates enzymes. 417 Cosmetic Researches Dead Sea Ltd is a manufacturer and worldwide distributor. -417 was founded in 2003. Moty Fridman, the founder, CEO and share holder in the company is a business man and a sculptor born in Israel. -417 is the Developer of an Exclusive and Unique Collection of Skin-Care Products based on Natural Active components and select minerals from the lowest place in the world – the Dead Sea. -417 exclusive products are sold in the International market through the following distribution channels: department stores, perfumeries, cosmetic chains and leading spa and hotel facilities. The -417 Brand offers a wide range of exclusive skincare products of high quality, based on The Vitamin Mineral Complex, a scientific combination of the rich minerals of the Dead Sea and natural active components as anti oxidant energizing vitamins and unique plant extracts, design to assist in regenerating skin cells and preventing aging signs. The products are based solely on natural active ingredients and do not contain any artificial preservatives such as Paraben and unfriendly components such as Mineral Oil. You have to mention your name/username and Email Id in the Google Docs form and fulfill any one of the conditions from (a) to (m) or else your entry will be considered invalid. Mentioning your Email Id and fulfilling any ONE of the conditions from 3-15 (as mentioned on the form) is absolutely compulsory for your entry to be valid. . Do as many or as few as you want! The more conditions you fulfill, the more points you get, thus increasing your chances of winning. However, I'll accept only one form entry from each one of you, so enter all the information carefully and correctly at one go. BTW, if you do face any issues, inform me through a comment or use the contact page on my blog. Also please leave a comment on this blog post after you complete this form. But please keep in mind that a comment will NOT be considered as an entry. You will have to fill the form to qualify for the contest. Only US readers are eligible. The giveaway ends on Sept 22, 2011and is open to US readers only. 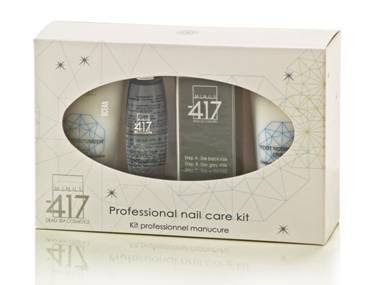 One lucky winner will be chosen through random.org and gets to win a Professional Nail Care Kit from -Minus417. The results will be announced on Sept 23, 2011.